In February 2014, Aska and Tomo Hamakawa separately received a humbling and inspiring award called the Unsung Heroes of Compassion from His Holiness the Dalai Lama. The award selects 50 individuals from around the world every four years to recognize their tireless, compassionate efforts to make this world a better place. Not convinced that their contributions deserved anything close to such an award, Aska and Tomo even declined the award at first. But, an exciting prospect emerged and eventually changed their minds. That was Bella Galhos. “If we could bring Bella as a guest to the award ceremony, then that itself would give meaning to the award,” they thought. For over a decade, Aska and Tomo had worked in international development and met many inspiring individuals, but they couldn’t think of anyone more suitable for the Unsung Heroes award than Bella. Bringing Bella to the award ceremony and enabling her to tell her story to influential people would open up invaluable opportunities for her. Aska and Tomo realized this bridge-building chance would give deep significance to their accepting the award. They first met Bella in 2007 when they were all pursuing postgraduate studies at the University of Hawai’i. While studying to learn how to rebuild her own young country of Timor-Leste, she was sending a part of her scholarship fund as remittance to support her large family in Timor, including 43 siblings and dozens of relatives. Listening to her life stories and future vision, Aska and Tomo made a commitment to support her whenever she decided to take real action. Invited to attend the Unsung Heroes award ceremony as their guest, Bella shared with Aska and Tomo her dream to start the first environmental education facility in her country. She also explained how the Timorese government had decided to withdraw the financial support it had once offered to the green school initiative. It was then and there that Aska and Tomo began to support Bella. This marked the beginning of Earth Company. The world is blessed with inspiring individuals like Bella who serve as agents of hope – trusted by the community. In their journeys around the world, Aska and Tomo have had the good fortune of encountering some of these extraordinary, heroic talents who are mobilizing people and creating social change. These “Impact Heroes” – as we call them – do not necessarily have access to sufficient resources whether it be financial, human, or others. Thus, the purpose of Earth Company is to shed light on these individuals and provide them with access to resources they can leverage into making a tangible social impact. Earth Company envisions a better, more livable world for our children and grandchildren, created by empowering these Impact Heroes – the frontline change-makers and agents of hope. Earth Company aims to create a world that can be passed on to future generations. This Native American proverb underlines the philosophy at the very core of Earth Company’s existence. The world we live in faces critical and complex challenges. It is estimated that if the world’s population lived like Japan, we’d need approximately 3 earths to support us. That number rises to 5 were we all to live like the average American. The myopic, consumption-oriented economic development we’ve seen in the 20th century has had a catastrophic effect on our world’s environment, society, and people – to our own detriment. We see this effect in human-induced climate change, greater economic inequality and extreme poverty, the breakdown of communities and a whole host of other strains on society. Without significant change to this system, we simply won’t have a future to provide our children, grandchildren and beyond. However, we are at last realizing as a species that our current way of life is just not sustainable. There is growing action to find solutions to both environmental and social challenges; the number of social entrepreneurs and businesses working to address these issues is growing every year, and the movement is steadily gaining both strength and momentum. At Earth Company, we envisage a world in which individuals and companies take responsibility for the impact of their own actions on the future of this planet, and governments adopt a model of development that not only values but prioritizes human values and the future of the planet. Earth Company empowers and inspires change-makers who realize social change for our future generations. To create a world that can be passed on to future generations, we need to see a step change in the attitudes of individuals and nurture change-makers. We as a community also need to accelerate the transition from pure profit orientation to creating shared value. Earth Company is a collective of digital nomads. At Earth Company, we want to create an environment in which our core team of eight, spread out across four continents, can maximise their potential. Without a fixed location or office, the aim is to make the most of the technologies now available to us to work in whatever place and at whatever time suits us. An attractive option to many, an estimated 30% of the US labour force are now considered digital nomads. This, for us, means respecting a work style that suits their own lifestyles and circumstances. If you need to be home or work unusual hours because you have childcare commitments, or if you move to an area that means you can only work remotely, it shouldn’t limit the impact you can have through your work. This flexible work style gives individuals the opportunity to do rewarding work whilst enabling us to work with highly capable individuals whose talent and experience might otherwise be wasted. We use the technology available as best we can to ensure that we are connected, and feel as such, whether that be messaging apps, video conferences or cloud storage. Work-life balance will play a crucial role in a sustainable future, and that is why we feel that we ourselves must take the lead in showing how it can be done! 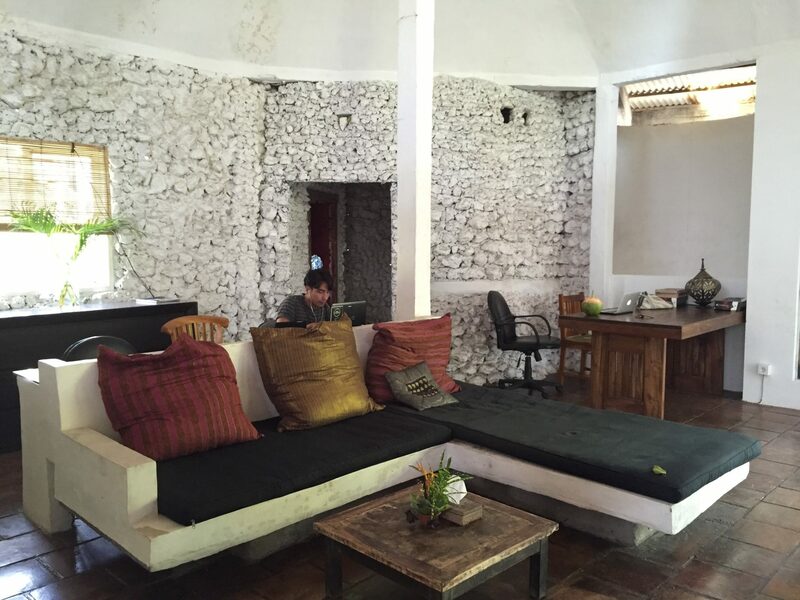 Our Bali Team is based at a co-working space in Ubud – the Onion Collective. The Earth Company team in Bali is fortunate to be housed at the Onion Collective for free thanks to the generosity and support of its founder, Mark Kuan. Nestled in the heart of Ubud, the Onion Collective is a co-working office for designers, developers, copywriters, and marketeers, with a pool, restaurant, and guest rooms attached. Earth Company is grateful for not only the physical space, but also the creative spirit that the Onion offers. Did you know that Bali is becoming a hub of social innovation? From the world-famous Green School to the award-winning social enterprises like Kopernik and Bumi Sehat, Bali attracts and nurtures social entrepreneurs from the around the world. Combined with the unique local culture and breath-taking nature, the “Island of Gods” is home to a number of innovative ventures today. One of the key factors in the creation of such a social entrepreneurial community is the emergence of 10 or so co-working spaces that have sprung up in the past few years in Bali. Both short-term guests and long-term residents work out of these shared economy platforms not just to keep each other company, but to exchange ideas and collaborate with like-minded individuals. In this idyllic environment, digital nomads from around the world, all with their own specialisms and areas of work, come together to exchange ideas, share knowledge and build a community of like-minded individuals. This website too was born in Bali! This website was created by Mowgli, an Italian web-marketing and strategy consultancy.